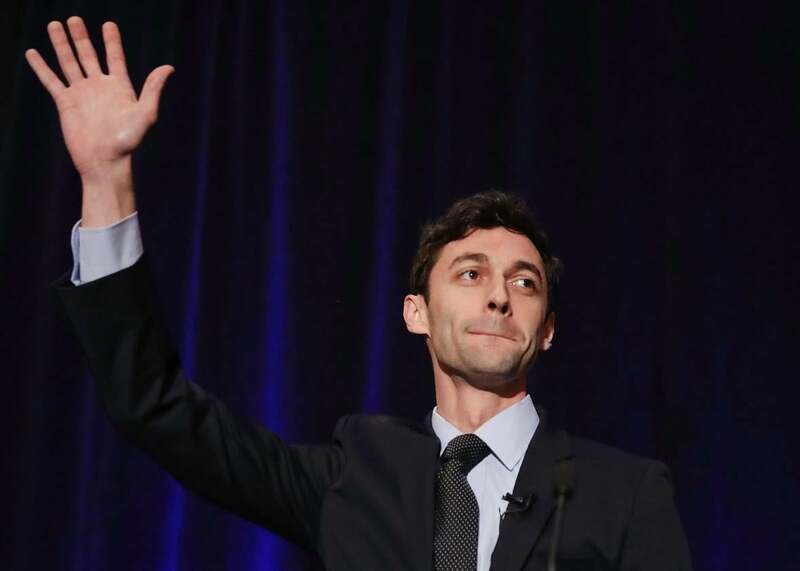 Why Georgia’s special election was a Democratic win, even if Jon Ossoff ultimately loses. Even if Jon Ossoff ultimately loses. Democratic candidate Jon Ossoff speaks to his supporters in the special election for Georgia’s 6th Congressional District, on Tuesday in Atlanta. Last Tuesday, Democrat James Thompson came tantalizingly close to winning the special election for Kansas’ 4th Congressional District, previously held by Republican Mike Pompeo, who left the seat to serve as CIA Director in the Trump administration. At first glance, the race doesn’t look especially competitive; Thompson won just 45.7 percent of the vote, to 52.5 percent for his opponent Ron Estes. But you have to consider the context: Pompeo won that same seat, five months earlier, with 60 percent support. His Democratic opponent won just 29.6 percent of the vote. Thompson, in other words, shrank a 31-point margin to just 7 points, a remarkable swing in a district that is 15 points more Republican than the nation at large, making it the 74th most conservative district in the country. It’s true that Democrats didn’t win the seat—fueling a round of possibly overwrought recriminations as activists and observers slammed the Democratic Congressional Campaign Committee for holding back support—but it was still a victory, or at least a sign of good fortune for Democratic efforts to win the House of Representatives in 2018 or 2020. This past Tuesday saw a second special election, in Georgia’s 6th Congressional District, with Democrat Jon Ossofff facing off against a phalanx of Republican candidates in a so-called “jungle primary,” all vying to either win more than 50 percent outright, or go to a runoff election in June. Another solid red district, the Georgia 6th gave Republican Tom Price—now Trump’s secretary of health and human services—nearly 62 percent of the vote in November. On the presidential level, Mitt Romney won by a similar margin against Barack Obama in 2012. But Donald Trump barely squeaked out a win there, making the district a prime target for Democrats. Ossoff collected millions in donations and amassed an army of grassroots volunteers. But while he won the lion’s share of votes, 48 percent to just under 20 percent for his nearest competitor, Republican Karen Handel, he didn’t escape the runoff. He’ll vie again for the seat in June against Handel, in a race where neither candidate has a clear advantage. One way to read this is that Democrats have failed. (That is what Press Secretary Sean Spicer said explicitly on Wednesday.) That for all the base anger, there’s not enough energy or organization to capture Republican districts and deal an actual electoral blow to Donald Trump. But this is shortsighted. Ossoff’s performance represents a major swing from November. And this, in a previously safe Republican district, with just four months to mobilize and build a campaign. It might not be success, but it’s indicative of shifting political ground. The next special election, for Montana’s at-large congressional seat, is in similarly red territory; the district is 11 points more Republican than the nation at large. And the one after that is for a district, South Carolina’s 5th, that is 9 points more Republican than average. In either race, a swing of the sort we’ve seen in Georgia and Kansas would be significant, even if Democrats lose. Movement with that consistency would suggest a worsening national atmosphere for Republicans, one in which Democrats could potentially take the 24 seats they need to win the House next year. According to the Cook Report, there are 59 Republican-held seats in districts that are less conservative than the one in Georgia. Both Kansas and Georgia, in other words, are good national omens for Democrats. They also have an immediate, present effect. Now is the time when lawmakers are making choices about their careers—where they decide if re-election is in their futures, or if they will retire. The kind of atmosphere where Democrats are competitive in solid and deep-red districts is one where vulnerable or wary Republicans think twice about filing for another election. It’s not hard to imagine a scenario where, following tight contests in Montana and South Carolina, Republican lawmakers start announcing retirements. Already, Utah Rep. Jason Chaffetz—following vocal criticism from constituents and constant ridicule for his conduct as House Oversight chair—announced on Wednesday his plan to “return to the private sector” at the end of his term. Would-be incumbents clearing out strong Republican seats also would have the potential to make races in those districts more competitive going forward. If nothing else, beyond retirement, Republican lawmakers will think twice about backing the Trump administration if doing so yields a real challenge for their seat. On the other side, recruits are always easy to find when the field is in your favor, and Democrats may find themselves, for the first time in years, with strong candidates to run in as many districts as possible. Yes, there are larger factors at work. If, between now and next year, Donald Trump becomes popular, the situation changes. Likewise, if the economy experiences an unprecedented boom, the situation changes. But if we assume more of the same—an energized Democratic base and a flailing administration, mired in controversy—then Democrats enter the 2018 election season on favorable terrain. The question, then, is if Democrats can utilize that advantage, not just to flip the House, but to rebuild the party itself, and make it a regular presence in those places where it’s been absent. The time for a long-term strategy is now, and it remains to be seen if Democrats are up for the challenge.